Helping businesses create more business. ﻿﻿Established in 1988, Ardent Signs has been building a reputation as Scranton's best full service custom sign company for over 25 years. We are your number one choice for outdoor signs, commercial signs, lighting services, lettering and design. 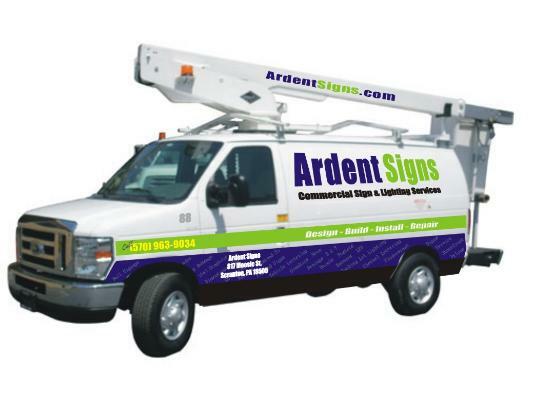 Ardent signs is your one stop shop for all of your business sign making, vehicle wrapping and sign lighting needs. Whether you are looking for electrical signs, custom storefront or restaurant signs, neon signs, or fabricated signs, Ardent Signs is the name you can trust and depend on. We offer the most competitive pricing in the area. It is no surprise that Scranton business owners have been looking to us to help increase their visibility and enhance their advertising. ​Are you looking for commercial sign and design solutions? Let our professional sign company design a custom sign for you today. Our sign makers in Scranton Pennsylvania are the best in the business and maintain a high-quality standard throughout every step of the sign design process. ﻿You may already know that storefront signs are one of the most under rated forms of company marketing. While Internet marketing is increasing, it is equally is important to have your logo and company name clearly visible. Signs are often considered the most important part of advertising your business and commercial properties. Designing a custom sign will not only brand your logo but can also showcase quality, and announce future events and products. Let us show you why we are ranked as the top sign company in Scranton and Northeast Pennsylvania. Whether you are looking for commercial signage on route 6 in Dickson City, Honesdale, Wilkes Barre or Dunmore; or you are looking for a commercial sign for your restaurant or company, we are eager to impress you - Call Ardent Signs today! Your choice for vehicle lettering and vehicle wrapping! Theres no better way to increase your company's visibility than driving around with a new professionally designed vehicle wrap with your name on it! Our vehicle lettering service is the best in Northeast Pennsylvania and can create the perfect vehicle lettering for your fleet or commercial vehicle! ​Why choose Ardent Signs? That's easy! but it will draw your customers in and make them feel at ease. Our custom sign company in Scranton PA will work with you and help fabricate and install a sign that you will surely love. Planning for business expenses can be a daunting task. Here at Ardent Signs, we pride ourselves in offering competitive and affordable sign prices and options for local and commercial businesses in Scranton PA. We understand that sometimes your budget gets cut, leaving very little money for advertising. Since we know this, we remain the most affordable sign company in Scranton. Since 1988, Ardent Signs has been providing service excellence and high quality signs in Scranton PA. What separates an average sign company from a great sign company is experience. We will without a doubt impress you with our knowledgeable staff and friendly courteous sign makers. with with a 32 foot safety bucket and crane truck. Is your company sign acting up? Perhaps there are some bulbs burned out on your restaurant sign in Scranton. No problem! We will happily service and repair your sign for you! Having a successful business means attracting positive attention. Once you have your clients attention, you now have the ability to sell them on your product or service. Do you need a business sign in Scranton PA? Signs are an excellent way to welcome clientele into your business or establishment. Your business sign is a pivotal investment for your company and having the right sign that is well lit will cause the Passer by to take a 2nd look at your business. That elegant sign should leave a lasting impression and draw potential customers into your establishment. Get A Free Fast Quote!